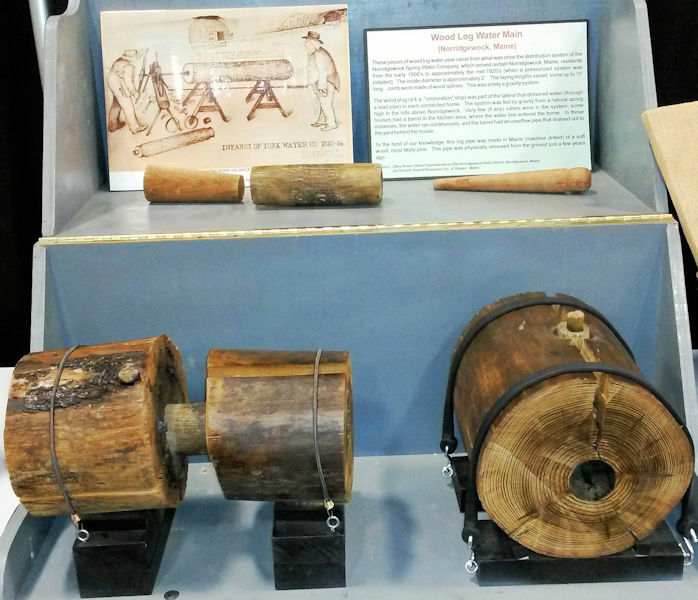 This portion of the Sewer History Exhibit shows early wood pipes used to distribute water. An informational sign provides background about the process. Photo courtesy of David A. Hofer. In 1993, an AZ Water Association committee came up with a novel idea while developing the agenda for a national collection systems conference. 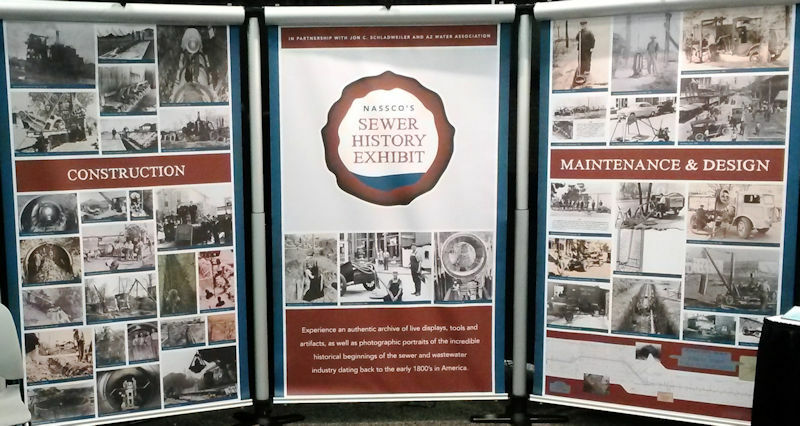 How about creating an exhibit of historical sewer photos to display at the conference? Jon Schladweiler, co-chair of the committee and amateur history buff, was all in and got to work building the exhibit. 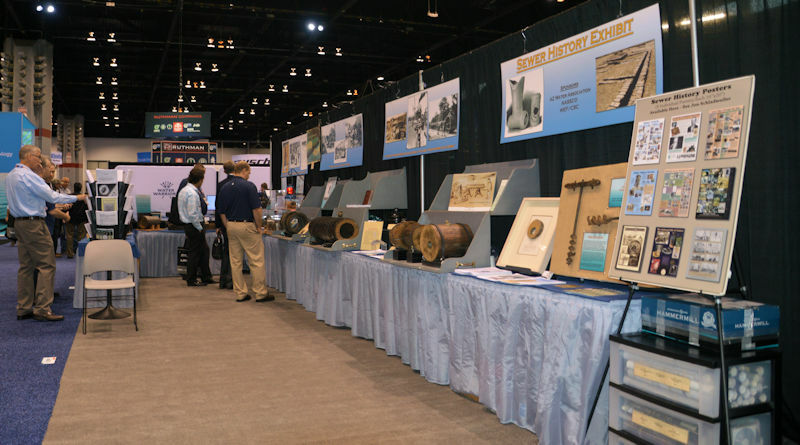 Twenty-five years later, this sewer history exhibit involves much more than photos and has traveled the country, appearing at more than 75 conferences, trade shows, and other sector events. It has been the subject of a 2006 episode of “Modern Marvels” on the History Channel. Schladweiler also has developed a 90-minute presentation covering 5500 years of sewer history that begins by discussing the exhibit. The exhibited collection is housed in two hand-built crates that, fully loaded, weigh more than a ton. It has grown to include rare wooden, clay, and cast-iron pipes as well as historical documents and sewer artifacts. 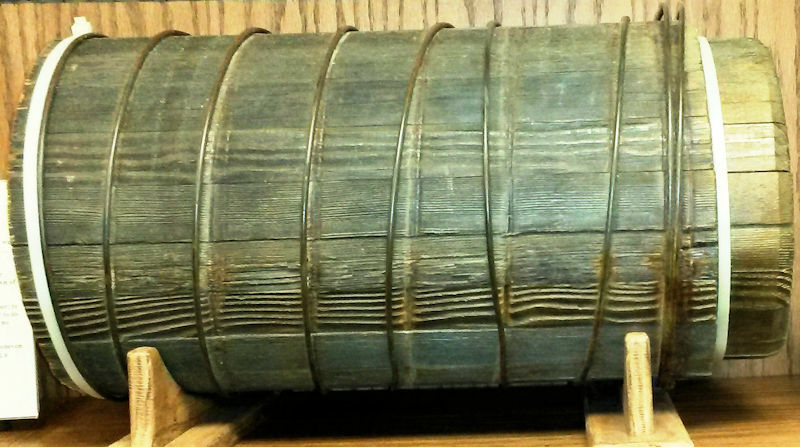 Visitors of the exhibit also can see a wire-reinforced wood stave water pipe. Photo courtesy of Hofer. Some pieces — like the wood stave pipe from an abandoned Colorado mine — Schladweiler found himself. Others arrived in boxes through the years from colleagues he solicited for contributions. 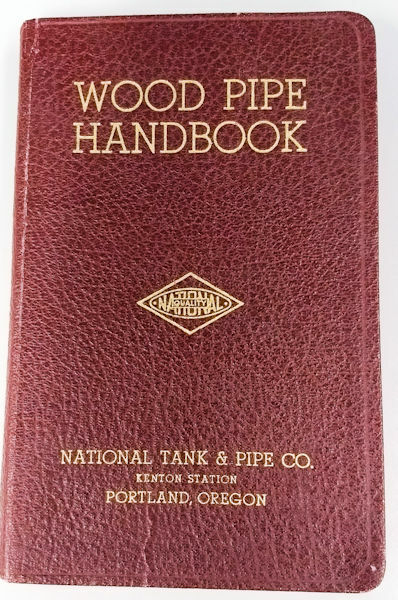 Find a second-edition copy of the Wood Pipe Handbook, in the collection. Photo courtesy of Hofer. Dave Hofer, who was preparing to retire from a 36-year career in the Newcastle County (Del.) Public Works Department, also enjoys sewer history. Like Schladweiler, Hofer is a member of the Water Environment Federation (Alexandria, Va.) Collection Systems Committee. Hofer is also a member of the National Association of Sewer Service Companies (NASSCO; Marriottsville, Md.). One discussion between Hofer and Schladweiler led to another, and in 2014, NASCCO became the new owner of the sewer history exhibit. Hofer became an apprentice to Schladweiler, while holding down a part-time job with a consulting engineering firm. Schladweiler today handles exhibits west of the Mississippi, while Hofer takes care of those in the East. For both, it primarily remains a labor of love, with NASSCO covering expenses and awarding periodic honorariums for their service. 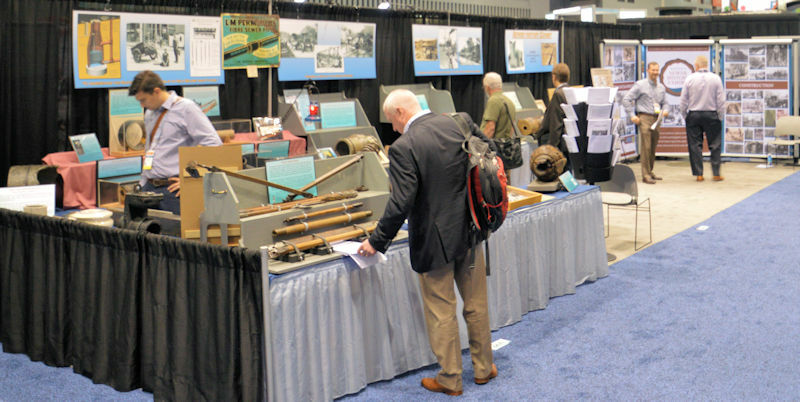 WEFTEC 2017 attendees had an opportunity to visit the exhibit and learn about the history of water infrastructure. Photo courtesy of Jon Schladweiler. The exhibit has not changed much since NASSCO assumed ownership, but it hasn’t lost its appeal among sewer enthusiasts. “There are some people who stop by every time we’re at a conference. Or, if it’s a three-day conference, some will come in all three days,” Hofer said. Those attending WEFTEC 2018 can see the exhibit again in booth 335. Photo courtesy of Jon Schladweiler. Some elements of the exhibit continue to be favorites. They include a rare piece of handmade clay pipe from the Spanish San Luis Rey Mission in Oceanside, Calif. and an early 20th century flushing valve, and a photo tribute to Ed Norton, who starred as fictional sewer worker in the movie adaptation of Jackie Gleason’s television series, The Honeymooners. “He is the hero of our business,” Hofer said. A three-panel display introduces visitors to the Sewer History Exhibit. Photo courtesy of Hofer. As the exhibit’s new owner, NASSCO would like to see the exhibit reach even more people, according to Sheila Joy, the organization’s executive director. For that to happen, it will likely undergo some changes. “In its current form, the exhibit is extremely cumbersome,” Joy said. Five of the heaviest pieces require two or more people to lift. “I’d like to see us partner with other organizations and sponsors to create an interactive video that we could show at events where we can’t [transport] the exhibit,” Joy said. Another option would be creating a modular exhibit that includes a few more easily transported artifacts that are presented in combination with the video. 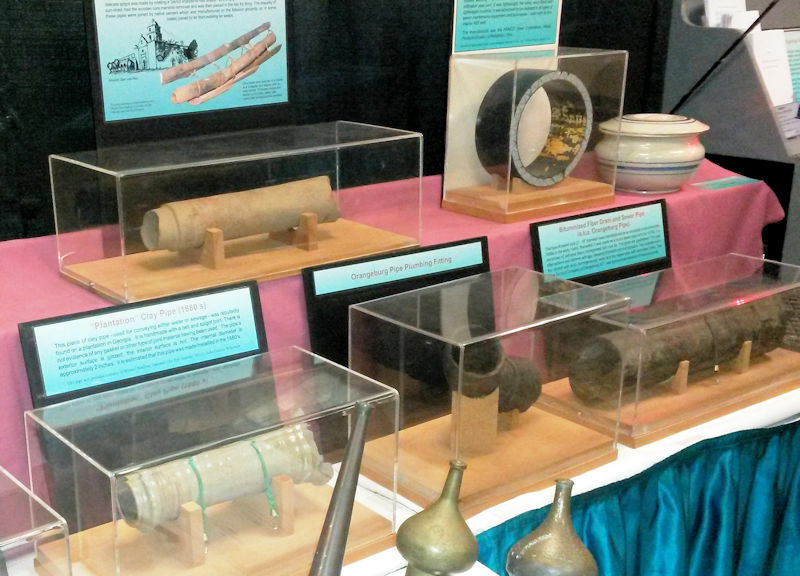 One collection of artifacts in the exhibit includes a hand-made, clay pipe from a California mission, a section of a Truss pipe, a chamber pot, and an Orangeburg, bituminous-fiber pipe. Photo courtesy of Hofer. Hofer would like to begin recruiting future curators. He has visions of developing displays for plastic pipe, manhole covers, and sewer rehabilitation.